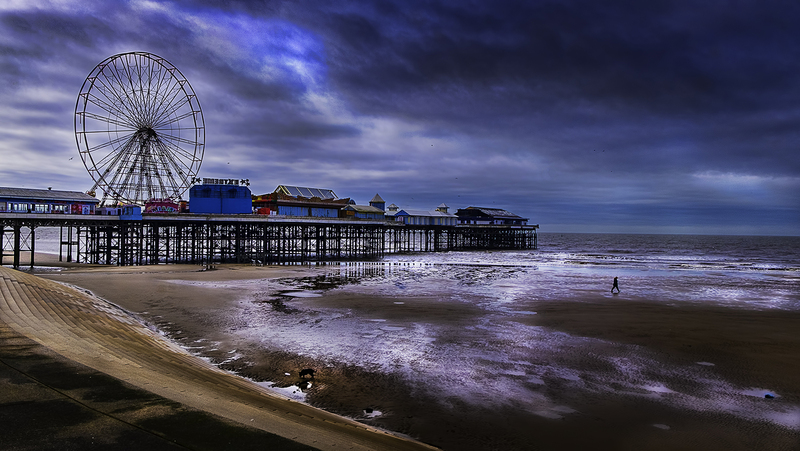 Blackpool in the North-west of England is famous for its three piers, places of entertainment and fun for children and adults alike. In the summer months the sea front is thronged with holiday makers, but what is it like in the midst of winter, this is what I am depicting in this picture. February is cold wet and bleak and yet there is a certain kind of beauty to be found in the abandoned places. I was wandering along the sea front considering abandoning the area and moving inland to try some street photography when I spotted this walker with his dog just picking their way under the wet pier, I knew I could bring out the reflected light in the water using a combination of Lightroom and Photoshop and holding the shadow areas of the sky would entail a little dodging and burning. But what interested me was to see if the walker would co-operate and find his or her way onto a bright area so that I could pick out the figure and contrast it with the emptiness of the scene. It took about twenty minutes of patient waiting before the person was in place however the dog would not co-operate until just for a split second it decided to take a drink just by a bright patch of water 1/125 of a second later the shot was mine. Back on the computer it was a little work to balance out the whites and blacks at one point I cropped out the sea wall but on further consideration the wall itself leads the eye into the frame and along the Pier so in it remains. A testament to people not being held back by Nature, also the beauty found in the Fylde coast.